I was standing at the front of a queue in a packed art shop in London. There were 15+ people crammed in behind me and I felt more embarrassed than I could remember. I had been a researching new art materials and product releases, I’d spotted something new out and I was convinced the store stocked it. Honestly, if you’ve ever been corrected in front of an audience, you know how terrible it feels. Even now, when I work with Alkyd paints, a little piece inside of me is physically wincing. Now it seems trivial, but at the time I felt mortified. One little word or turn of phrase out can make a big difference. So this is a practical guide to understanding oil painting terms, products, and more importantly pronunciation! Many oil painting terms stem from Latin roots so mispronunciations (especially with me) are commonplace. When I was studying in Italy, Vanessa was trying to order a liqueur after we’d had a fantastic meal in the Tuscan hills. After a prolonged exchange with the waiter, he asked should he call an Ambulance? What had she asked him? We were confused, all we wanted was a drink! The offending pronunciation was a simple misunderstanding. We never did get that drink, but hopefully, this guide will help you feel confident when choosing materials and talking about the techniques. Alkyd mediums – (Pronounced: al-kid) an alkyd is a synthetic resin that can be added to oil paint to speed up the drying time of the paints. You can buy an alkyd-based medium that you can mix in with your oils, the most commonly available is Liquin by Winsor & Newton, Gamblin also produces an alkyd medium called Galkyd. Alkyd Paints – these paints are commonly known as fast drying oil colour and can be handy if you work quickly or have a tight deadline for a client! Different brands have different names e.g: Winsor & Newton have Griffin Alkyd. Pro tip: Alkyd oil paints have been developed more for the hobby market so the quality of the pigments used can often be less intense than standard artist quality paints. Gamblin have produced a lovely paint called ‘fast matte.’ It is both fast drying, artist quality and dries with a matte finish. This is very handy if you are going to paint on top with standard oils because the matte surface gives you a ‘grab’ for the paint to form a strong bond. (nerd alert – the Alkyd is called a resin because it dries by solvent evaporation, rather than oxidation (exposure to air) like an oil. Alla Prima – (Pronounced: ah-luh pree-ma) this is an Italian phrase that describes a painting created entirely in one sitting, it translates as ‘at the first’. 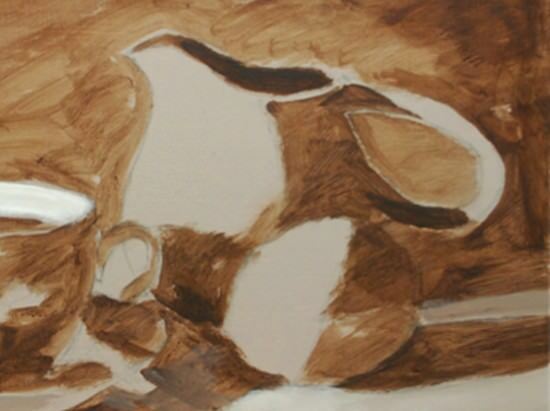 Usually, there isn’t any underpainting to the piece and is created in one go. ASTM – a labelling on paint tubes that is an International Standard for testing and material qualities. Bloom – a dull, progressively opaque, white effect that can appear on varnished surfaces if the paintings are kept in damp conditions. Brushwork – this describes the characteristic way that each artist paints. It is like your personal signature to your painting. Campitura – An even, opaque, flat tone applied to the canvas by mixing coloured pigment with white gesso primer layer to create a tinted coloured ground. Chiaroscuro – (Pronounced: key-ARE-oh-SCURE-oh) an Italian word literally meaning “light dark”. Most usually used to describe a painting created with strong contrasts, such as Caravaggio. Cold pressed linseed oil – oil often used in the grinding process of oil paints, the oil is extracted from Flaxseed, without the use of heat. The process takes longer than extracting using heat but is a purer oil. Colour Field Painting – a style of painting prominent from the 1950’s through the 1970’s, featuring large “fields” or areas of oil colour, meant to evoke an aesthetic or emotional response through the colour alone. Copal – this is a natural resin, used in making varnishes and painting mediums. Craquelure – (Pronounced: krak-loo r) this is the term used to describe the tiny cracks and fine lines covering the surface of old oil paintings. They are caused by the shrinking and movement of the ground and the oil paint surface. Crazing – very fine surface cracks or lines that appear on the surface of a varnish film due to unequal drying times. Dammar – a natural resin, used in making mediums and varnishes. Dammar can also be spelt Damar. Dead colouring – a term used to describe the under-painting of a painting, when using a lean oil paint mix. The mix is usually diluted with turpentine or OMS which evaporates quickly leaving a matte appearance. It allows you to quickly establish the tonal values using a thin application. Drier – a material that speeds up the drying time of the oil paint. Traditionally, driers were cobalt driers, but now they are often Alkyd resin dryers. 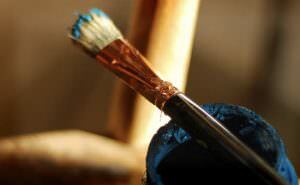 Dry Brush – an effect when you have very little moisture on your brush to apply the paint. When you use a dry brush you need more of a scrubbing motion and it leaves a broken colour effect. Drying time – how long the paints take to dry. Different oil paints contain different quantities of oil binder, depending on how easily the raw ingredients ‘mix in’ with the oil. So some paints are fast dryers (such as Burnt umber) and others are slow drying (Ivory black). Drying oils: oils such as Linseed oil, Walnut oil and Poppy oil that have the chemical properties of creating a solid, elastic surface when exposed to air (oxidization). Non-drying oils – unsuitable for oil painting are Olive oil and Almond oil. Egg tempera painting – egg (either whole, yolk or white) can be used as a pigment binder. Tempera painting was very popular until the late fifteenth century. Fat – this describes the oil content in paints, for example, Burnt umber has a ‘low fat’ oil content, so it is a fast drying oil paint because there is less oil in the paint mixture to oxidise and dry. Ivory black has a ‘high fat’ oil content so takes longer to dry. Fat over lean – means that each succeeding layer of paint should have more ‘fat – oil’ than the preceding layer. 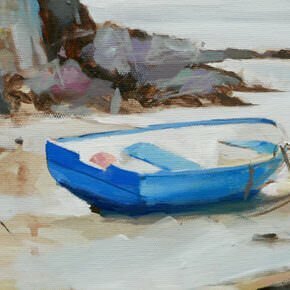 If you are painting in an indirect method (working in layers rather than all in one go – alla prima) you need to adhere to this rule to prevent cracking. Film – a fine layer of paint or varnish that has hardened. Too little binder in the paint can cause a ‘weak paint film’. Flat colour – paint applied in a solid, flat colour, like the paint on your wall at home. Fugitive pigment – a phrase used to describe a pigment’s impermanence and tendency to fade or change colour under the influence of natural effects such as sunlight, heat, water, etc. 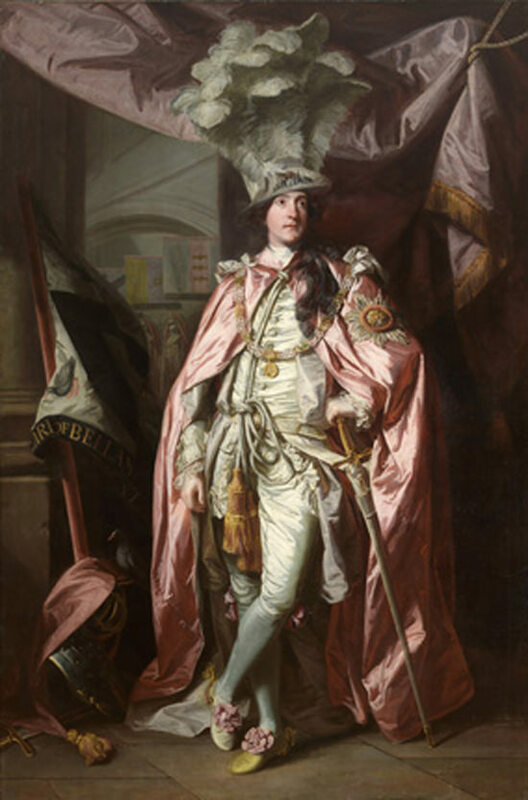 Reynolds famously has many portraits that have lost the skin tones because he used Alizarin crimson which was a fugitive pigment, however, modern Permanent Alizarin crimson has a permanence A. Note: this should not be confused with Lightfastness which is how the pigment is affected by light alone, although often they tend to cross over. Gallery Tone – the yellowish colour of old paintings usually caused by the ageing of natural resins used in a painting or varnish. Gesso – traditional oil gesso is a mixture of glue (usually rabbit skin) water, and chalk (calcium carbonate) used to create a flexible, yet absorbent surface for the oil paint to be applied onto. Glass Muller – a glass muller is needed when grinding paint by hand and to coat the dry pigment in medium. The base of the muller has been sandblasted to form a slight roughness and is usually slightly curved. The surface you grind on to, usually glass, can often be slightly textured to help with the grinding process. Gloss – the appearance in sheen of the paint or varnish. For example, Alizarin crimson has a glossy surface when dry. Glazes – the term used for a thin, transparent layer of paint. Glazes are used on top of one another to build up depth and modify colours in a painting. A glaze must be completely dry before another is applied on top. Traditionally glazes were used on top of a black and white under-painting called a Grisaille, thin layers of colours were then applied once the initial form had been established. The best paints to use for glazes are pigments that have a translucent quality. Grinding colours – a process of grinding dry pigment with a binder, usually mixed initially with a palette knife and then mulled down to a thinner, smoother consistency with a glass muller or marble slab. Grisaille – (Pronounced: griz-zai) a monochromatic oil painting which is often used in underpaintings or as a black & white painting technique. Ground – a thin layer of paint, applied to a support to make it ready for painting, can be white but I prefer to use a coloured ground. Half paste – a semi-translucent coat of paint that allows the dry underpainting to appear as if through a mist. Sometimes called a Velatura. Hue – labelling on a paint tube that denotes a combination of less expensive pigments that closely imitates the mass tone of a more expensive pigment, not to be confused with Hue when describing colours, as in the perceived colour of an object, the lemon has a yellow hue. Impasto – the texture created in a painted surface by the movement of the brush. Impasto usually implies thick, heavy brushwork, but the term also refers to the crisp, delicate textures found in smoother paint surfaces. Imprimatura – (Pronounced: im-pree-muh-tur-uh) an initial stain of oil colour painted on a white ground which provides you with a transparent toned ground. It is similar to a coloured ground but more transparent. It comes from the Italian for ‘first paint layer’. Often, the initial stain of colour painted on a ground is left visible in areas of the finished painting. Rubens, Singer Sargent & Anders Zorn used this technique in their paintings. Inpainting – this is a painting technique commonly used by conservators to unify a painting that has suffered paint loss and refers to paint applied over damaged areas only. Laying out – refers to either ‘laying out your colours’ on to palette (setting the paint out) or, laying out your composition, which was traditionally done with cut out drawings on paper. Lean – a term used to describe the low oil content in paints and mediums. Thinning with solvent results in a lower oil content to the paint mix, therefore a leaner mix. Lean paint – a paint layer or paint that has a reduced oil (fat) content. 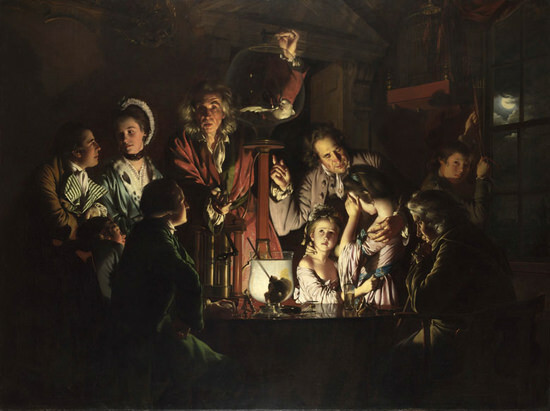 Lightfastness is especially important in painting because the length of time a pigment retains its original colour saturation and value determines the life expectancy of the work of art. Note: this should not be confused with Permanence which refers to the chemical stability of the pigment in relation to any chemical or environmental factor, including light, heat, water, acids, alkalis, or mould. For example, the pigment Ultramarine blue is extremely lightfast, but it will fade if brushed with a dilute acid. Lining – a conservation term for placing a new canvas on the back of a deteriorating original oil painting. Mahl stick – (Pronounced: mar-hl) a wooden stick used to lean on when painting fine details. It has a long handle with a pad at one end, you rest this end on a dry area of the canvas to help steady your painting arm when painting a detailed, controlled part. You can simply make your own by tightly wrapping a cotton wool in a ball around the end of a length of wooden dowel. Cover the cotton wool with a piece of fabric or chamois and you will be Old Master a go-go! 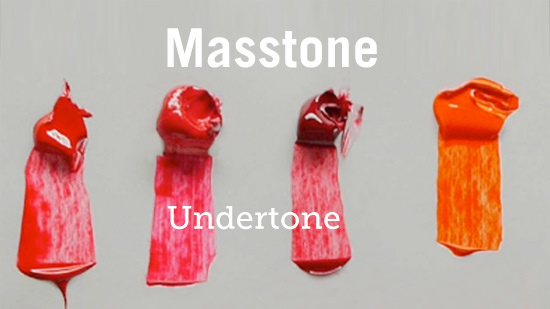 Mass Tone – the undiluted colour of a pigment or paint when it’s in a large blob. Also known as mass colour. Medium – the mixture that you add to your paint to dilute it, or to change consistency, drying time & working properties. Monochrome – a painting created in a range of tints and tones of a single colour. Natural varnish: tree resins (Mastic and Dammar), fossil resins (Copal and Amber), and insect resin secretions (Shellac). Oiling out – this is where you paint a very thin coat of medium over the painting to bring the colours back to how they looked when you first painted them. Depending on the absorbency of your canvas, the oil can soak into the canvas leaving the paint looking dull. This is called ‘sinking- in’. Oiling out can be used to blend wet layers into the layer below but is often best used when you’ve had a bit of practice with oils. It is most notable in dark areas of painting, and oiling out enables you to judge the colours as they were when you first painted them. I don’t usually recommend it for absolute beginners as you can get into a mess quite quickly and it can create issues with fat-over-lean principles. However, for more advanced painters, especially realist painters, it can be an invaluable technique to use. Paint body – description of the consistency of the paint, a thicker paint is described as having “a lot of body”. Just the same as Golden paints describe their thicker acrylics as ‘heavy body’. Plein air – (Pronounced: plen-air) a painting created outside rather than in a studio. The term comes from the French ‘en plein air’ meaning ‘in the open air’. Pigment – pigment is the substance or powder that makes up the colour of a paint. Pigments are either organic (carbon-based) or inorganic (mineral based). 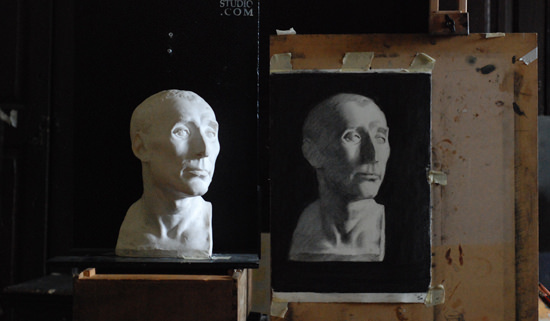 Priming – the application of sizes and/or grounds to a support to prepare the painting’s surface, modify its absorbency, texture and colour before you start painting. Refined Linseed Oil – made from the seeds of the flax plant. It adds gloss and transparency to paints and is available in several forms. 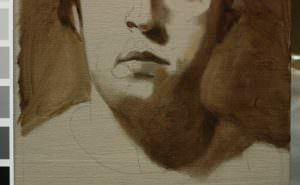 It dries very thoroughly, making it ideal for underpainting and initial layers in a painting. Refined linseed oil is a popular, all-purpose, pale to light yellow oil which dries within three to five days. Retouching – the work done by a restorer to replace areas of loss or damage in a painting. Scumble – very thin layer of opaque or semi-opaque paint that partially hides the under-layer. Scumbling is the painting technique where a thin or broken layer of colour is brushed over another so that patches of the colour beneath show through. It can be done with a dry brush, or by removing bits of paint with a cloth. Sfumato – (Pronounced: sfoo-mah-toe) from the Italian word for “smoke.” Sfumato is a technique of painting in thin glazes to achieve a hazy, cloudy atmosphere, often to represent objects or landscape meant to be perceived as distant from the picture plane. 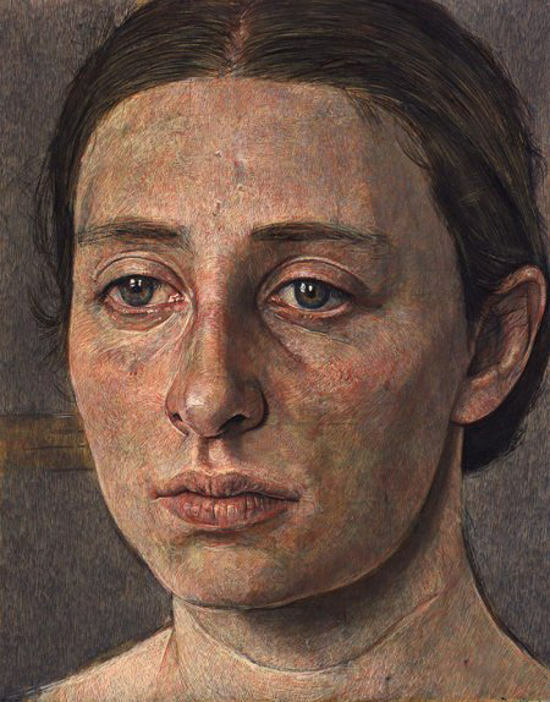 Sight-size – a painting technique where the key idea is that your eye needs to be able to see both the canvas and the subject in one glance, so they both appear the same size. This makes it easier to flick your eyes between the subject and your painting for judging shape, proportions and colours. The artists viewing position is roughly 6 – 12 feet away from the setup, so you step forward to make a mark and then step back to observe your painting again. This results in a more painterly, naturalistic finish. Sinking in – this happens when the paint medium is absorbed by the underlying layer of paint, this could be due to a too absorbent or unevenly applied absorbent ground. The resulting appearance is a visually inconsistent surface, some parts shiny, some parts matte. Size – a glue applied to fabric (canvas) or paper before priming to seal and protect it from the corrosive oil in the ground and paint. It’s also used to seal wood panels before painting. Acrylic Size is available which is water-based, odourless, archival and comes premixed. Animal lovers avert your eyes!!! Traditionally artists used rabbit skin glue, be warned if you want to give this a go as we did at art college, it is very, very, smelly, as to apply it you have to warm it up. Turpentine (spirits) – the traditional solvent or thinner for a drying oil (such as Linseed oil) distilled from the resin from certain trees, e.g the European larch, white fir, and American longleaf pine. 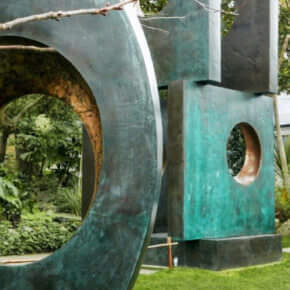 It is used to ‘cut through’ the oil in oil paints, however, due to this ability, it has a strong solvent smell so is best used in a well-ventilated area. Alternatively, I would suggest using an Odorless Mineral Spirit such as Gamsol, a safe solvent that allows oil painters to use most traditional painting techniques without compromising on the vapours. 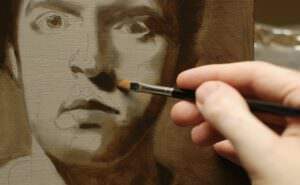 Underpainting – the initial stage or first layer of an oil painting commonly executed using a monochrome or dead colour as a base for the composition. Value – the lightness or darkness of a colour, rather than the actual colour. Varnish – a final layer that can be applied to a finished painting. A varnish protects a painting from environmental dirt and dust and is removable for cleaning and conservation purposes. Velatura – (Pronounced: vella-tora) essentially glazing with an opaque paint. A method of adjusting colours by applying semi-opaque or opaque layers of paint over an area of dry paint. It’s a bit like a mix between a scumble and a glaze. Verdaccio – (Pronounced: ver-dar-cheo) an Italian name used to describe a muted earth green used for creating a complete monochromatic underpainting. Often used as a nice base to apply warm, pinker tones on top of portraits. Are there any oil terms you’re still unsure of? Add them to the comments below and I’ll include them in the list. I’m not an oil painter (yet) but am familiar with most of the terms just from reading and seeing the terms mentioned in art magazines, etc.. A few were new to me. Appreciate the education. I love your anecdotes. when to use soff or hard edges? Great suggestion, I will update the glossary! This is great Will. Thanks once again for sharing the knowledge. Just want to thank you soooooooooooooo very much Will, for all your excellent tutorship, tips and advice. 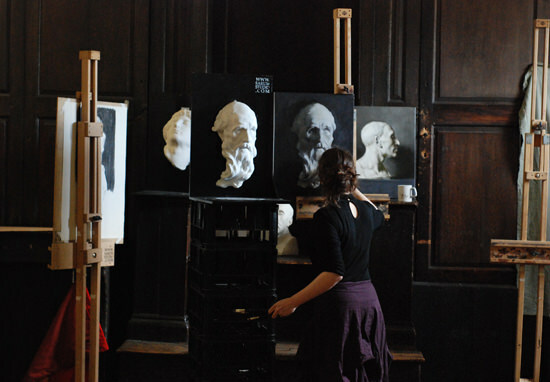 In particular, your excellent demos on Art Tutor. I am new to Acrylics, having painted in oils for many years and I particularly enjoyed your ‘strings’ demo in Acrylics as this is how I paint in oils. Please keep the Acrylics going as I find that ‘Watercolour’ seems to dominate the scene when it comes to tutorials! God Bless the work! Really pleased you have been enjoying the demos on Art Tutor, the techniques I use for Acrylics often stem from Classical Oil painting, so you should pick them up really easily. Thanks Will, I’ve always pronounced Chiaroscuro the wrong way, but I’ve only just realised!!! Ha, ha, cheers Mick, excellent choice of beverage! given you have put plein air in the mix I wonder if you could elucidate on “de tete” (spelling?) (french for ‘from the head/imagination’… I think??? I picked this term up reading about the conversations between Vincent and Gauguin at the yellow house. In general I prefer to paint from imagination, so I would like to be more confident employing this term. On the other hand, at the art shop last Friday I was talking about painting with the store keeper and when I mentioned my landscape focus he asked ” do you paint on location? ” When I replied “oh, plein air, ah no” he gave a wry, you’ve been reading too many art books, smile. I’m afraid I can’t enlarge on the description of ‘de tete’ other than it meaning ‘to come from ones head’ or imagination/memory. I’ll put it out to our French readers! Actually dear Will the idea of ‘memory’ is good. I had not put that together with imagination. I’m a fan of the Russian painter Nicholas Roerich who lived in India after the 1917 revolution and painted many Himalayan scenes. Some it would appear from memory and imagination. As an avid Himalayan traveler whose is pinned down with children these days memories keep me going back to the easel and sketch book to be worked with. Hey John, pleased it helped! sounds like you have some fantastic experiences to draw on. The Glossary for Oil Painting was special for us, especially we being Afrikaans and not familiar with all the terminology in art books. You’re welcome Joan, really pleased to hear it. You’re welcome, pleased you found the glossary helpful. All very well indeed mate. My painting term I.Q. has risen 99.9 points. With advice like this I would be willing to pay ₤15 just for. I was watching a tv doco on Da Vinci and his recently discovered painting last night and the presenter used what I thought was the word Sfumato to describe the smokiness of the face. Thus can the word sfumato also be applied generally to smokey effects such as in the face? There was an art history ‘fact’ that raised my eyebrows from the show and I realize from listening to curators at my national gallery that its worth double checking things to avoid art shop/crowd gaffes. Anyway, its great to have a glossary to peruse after watching such shows! Yes you’re right, Sfumato – from the Italian word for “smoke”, just means exactly that, to smoke the paint. It can be applied to anything from faces in a portrait to objects in the distance. Sounds like an interesting show, if you look at this Da Vinci painting you can see the Sfumato effect expertly executed on the cheeks and the lips. Interesting to contrast it with the sharp/hard line of the black collar. Muchas gracias por dejarme hacer parte de tu pagina, espero con tu ayuda, sacarle mucho provecho a los videos, y tutorías que publiques. Atte, Eudoro , (desde, Colombia). Thank you very much for letting me be part of your page, I hope with your help out big bucks for the videos, and tutorials you post. vítores Edudora, satisfecho que usted ha estado disfrutando de la página! Cheers Edudora, pleased you’ve been enjoying the site! I have just subscribed to your excellent website info. I was wondering if you have ever worked with water mixable oils and if so, what do you think of them? I started oil painting when I was younger and then didn’t paint for 30 years. I started again almost 3 years ago and chose water mixable oils to keep the toxin levels down as I have a grandchild with cystic fibrosis. I must say they have been quite a challenge and I am still trying to master them. They don’t run as well as the normal ones but I have persevered with them. I would appreciate your comments or advice. 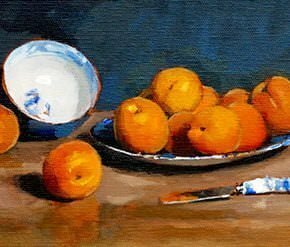 I have used the water mixable Oils before but found they didn’t have the pigment strength or quality that artist quality Oils have. They do have the advantage of an easy clean up but lack the qualities of Oil paint I love so much. What you can try as a medium alongside water is Walnut oil. 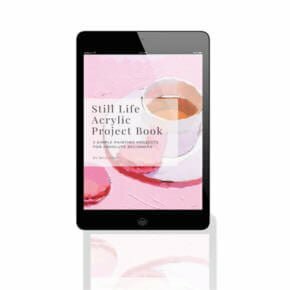 It is non-toxic and has a slower drying time than linseed oil, so mixed with the water mixable Oils should give you a bit extra ‘run’. In case you’re interested in brushes with water mixable oils, you want a brush that is a bit stiffer than a watercolour brushes but not quite as thick as a hog hair brush, due to longer exposure to water a brush with a mix of synthetic and natural bristles would work well. Winsor and newton have developed some brushes specifically with water mixable oil paints in mind that you might find useful, they are called ‘Artisan range of brushes. Thanks so much Will. I will look into the alternative paints. They sound like they’re worth trying, especially with such a good recommendation. I’m not sure how easy they will be to access here in Aussie land but I will find out..
You’re welcome Wendy, enjoy trying them out (here’s an Australian supplier than has 60ml tubes in stock. Thank you so much. I am onto it!!! But thanks Will,for all the info on this. Cheers Graham, really pleased you’ve found the article helpful. Hi Pamela, I’m not a aware of any specific terms for this technique, if you do track one down it would be interesting to know. I am about to do oil painting for the first time and your site helped me in imbibing all the technical details, yet I wanted to ask you that which solvent should I use for oil paints as a beginner. Any other tip is also welcomed. Hi Akanksha, either an Odourless Mineral spirit or Turpentine. Thanks Will…..I try out my first oil painting and will share my experience with you..!!!! I am a begginner and appreciated a lot many terms in your glossary. Thank you very much. I got across the term ” isolation coat” a layer before varnishing. Do you recommend it? You don’t need an isolation coat with oil paints, but it can help with acrylics. Here is an article you might find of interest. Hi will, i have a doubt that scaring me whether my painting will be ruined. I had completed a oil painting with linseed oil and glazes with liquin original. it is touch dry. some spots with gloss(linseed oil) and some area are semi gloss(liquin). i want even the surface with oiling in. i studied in internet about oiling. it said to use 1:1 turp & linseed. my fear is linseed is fatter. if i use 1:1 mixture above that linseed, liquin layer whether the below layers will crack? as 1:1 mixture is a thin medium when compared to only linseed. pls clear me will!!! Hi Vishnu, you might find this article helpful on varnishing an oil painting. Hi Will, is there an Italian of French term for the points or dabs of white paint to pick out the shine, say of the eye or hair or lip or jewel, etc., applied at the end? Hi James, there may well be, but nothing springs immediately to mind, if you track one down let me know! I had taken your Self Portrait course in Oils. I did that whole course and couldn’t believe i can paint like this. Thanks for designing this amazing course. Could you please elaborate this section please. What paint do you use for consistency? and what is blackest mix? A glaze is a method of altering the colour and tone of an underpainting by applying a thin translucent layer of paint. The best pigments for a clear glaze are the translucent pigments, So, I then mix a thin consistency of paint using the blackest mix (the Ivory black), to use as a glaze. This will be the most translucent as it contains none of the Titanium white (which is an opaque white). The level of consistency changes depending on how opaque or transparent you want the effect to be. I started painting just this summer and would have avoided a lot of confusion and mistakes had I simply found your glossary first, Will. I love your practical approach and easy to understand descriptions and explanations. I will soon be on your list of new online students, I’m sure. Cheers Steven, pleased to hear you found the painting glossary helpful. Hi Liz, yes, that’s right a Pentimento, good word! Hi Will, yes, thanks for the correction! Ha ha, definitely does Liz! Hi Henna, have a look at this tutorial on in-direct painting with oils. What is drybrushing technic to lighter paint.??? Hi Henna, dry brushing is to add a broken colour effect to the paint surface. I am working on oil painting as of now…My problem is in one part of painting….There is a sun shine is coming on one book…so how to show that sun shine on book… is there any technic????? Hi Henna, the best way to make the sunshine look bright is to make sure it’s surrounded by dark colours. So if you can place the book into shadow it will make the effect of the sunlight more realistic. If you have a look at this article and scroll down you will see a portrait I’ve painted with an open book being hit by sunlight, notice the difference in light and dark around the book. Thank you! You are an excellent teacher! Enjoyed and learned from the definitions and anecdotes! Question…how do I know which paint is fat and which is lean? Also, does the fat over lean rule apply to water miscible oils? Hi Barbie, the ‘fat’ and ‘lean’ is usually in reference to the amount of oil in the paint medium, but can also refer to the amount of oil used to grind each individual paint. You might find this guide helpful on the drying time of oil paints, the faster drying, the leaner the oil paint. Thanks so much for posting this information. It’s really helpful. I’ve been painting with oils for a while, and accidentally spilled some orderless turpentine in my small work area. I started sneezing like crazy, and felt pretty gross. Afterward, I was looking into alternatives for turpentine, and found that some people use Walnut Oil, and Walnut Alkyd Oil Medium. I’m still a little confused about the difference between the two. Also, I also read that using them as a paint thinner makes your paintings glossy. Is this really the case? Hi Steph, yes, you can use a Walnut oil medium as a non-toxic thinner for oil paint. The Alkyd version is a quicker drying medium than the standard Walnut oil. The thinned paint will be glossy because you are diluting it with oil, exactly the same if you diluted your paint with any oil. You won’t be able to create as lean a medium that you can do with OMS, but you’ll still be able to thin the paint. Oh, okay. Thanks. I’m exited to try it! What is the terminology for the technique where the artist flows the oil painting off the canvas, onto the wooden frame? Hi Sue, do you mean over the edge without framing the canvas? 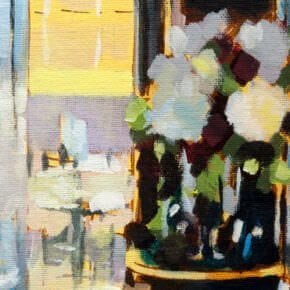 What’s is the term or is there s name for when an artist applies a thick white stroke on an area of the painting to catch the light and create a reflective light source? Hi Paul, I can’t think of a specific term that’s used for applying a thick stroke of paint to a reflected light source. It’s know as the ‘specular reflection of the source’ but that’s in light terms and painting thickly is usually called impasto, so you could call it an ‘impasto specular reflection of the source’, but it isn’t exactly snappy! I am thrilled to have found your website! Thank you so much for this glossary! I am new to painting and so many instructors move so fast in their explanations, assuming that everyone “speaks the language”, that often I am left in the dust and totally confused. I believe this will help me to “keep up”. Great to hear it Marie, really pleased you’ve found it helpful. I was curious about whether you have experimented with egg tempera. Several friends and I are looking for environmentally friendly painting mediums and materials. I thought to ask if egg tempera is possibly an option and if not, do you know of any mediums that we could use? Hi Laura, yes, egg tempera can be good to experiment with, it dries pretty quick. You can also use oil paint just using walnut oil and natural pigments. You might find this site of interest: Natural Earth Paint. I am a freelance artist and I’ve recently got into watercolour painting. I was wondering if you could help me find out what a specific painting technique/terminology is called. I’d describe it as using a vibrant variation of colours to create shape and depth of a subject. The colours are far from realistic but the shape and outlines of the object are. At first I thought it was called ‘Al Fresco’, but google images has proven me wrong. Hoping you can decipher my query. Hi Megan, is it Pointillism? What is the term for a painting that’s been painted on top of an older painting? Great Glossary, I would also add “Campitura” which means a ground to paint on, so often a thin ground of a neutral color which will make the painting harmonize., eg raw umber or burtnt umber , or green umber whatever lends itself to the actual painting you have in mind. I would also add Spike Lavender which was used before turpentine as a solvent. there are now some examples on the market ie Natural pigments have one. I think it is a safer alternative to other solvents and I use it to clean my brushes . Good one Vicki, I’ve just added Campitura to the glossary. Hi Adrian, Blocking-in is when you establish the tonal and colour underpainting by looking at the composition as ‘blocks’ of tonal value. The shapes are usually one flat tone without any heavy brushwork so you can establish a quick visual understanding of the colour and tonal relationships before you commit with thicker paint. Well, I will stop spelling it “couch”. I often hear fellow artists talking about “painting into a couche” meaning laying down paint onto a canvas that already has a layer of medium without pigment. Good one Tony, pleased it helped.